With Christmas being only 10 days away (Can you believe it?! ), I am feeling super festive!! 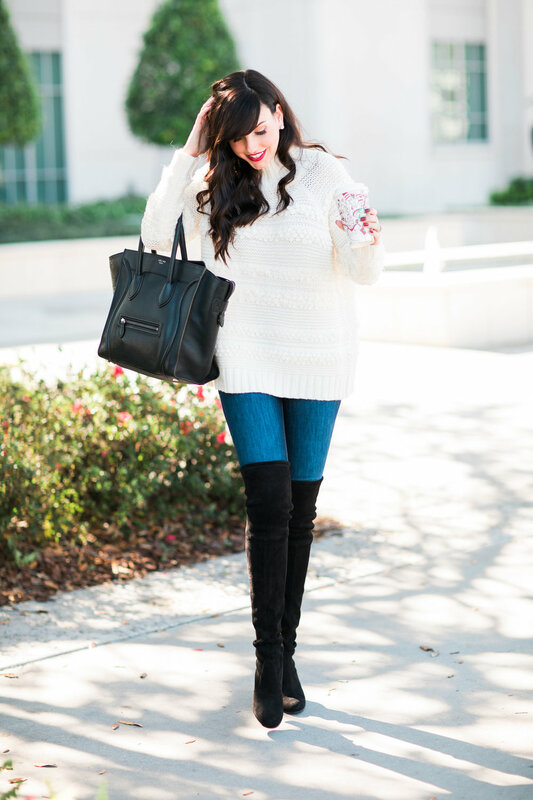 I love this ivory sweater because although I've dressed it up with a red lip and Holiday Decor to make it extra Christmasy, it is something I can continue to wear throughout the winter season well after Christmas. I am wearing a size Small so it fits pretty true to size and is a bit oversized in length which I love, so you could pair it with leggings too for an extra cozy look. I also love the cute little pom detail pattern on it, which keeps it from being a boring, typical ivory sweater. In fact one year several years ago I remember having to find a cute ivory sweater for my husbands family Christmas photos (this was before we got married). It was so sweet of them to include me, but with my lighter skin, ivory can totally wash me out, and that year there were like ZERO cute ivory sweaters! LOL! Where was this one when I really needed it?! Wish I could find those photos to share with y'all haha!! Anywho, I've linked all details to shop what I wore and similar items below, just in time for Christmas. May it be a Merry one!